To tell the truth, the interface of the actual GRE is grainy looking and probably was never changed from the late 90th when it was first introduced. So if you prepped solely from books or from online services that have nice glossy design then you may be surprised or even frustrated on the test day. One easy way to protect against this happening is to prep using official PowerPrep software. But, those two example tests may be not enough to get used to all the features and look of actual GRE, so you can try out our GRE Online Prep test service which completely resembles actual GRE test features, therefore, on the test day you’ll be familiar with a feel and look of the GRE and will be able to focus your attention on solving problems and scoring high. 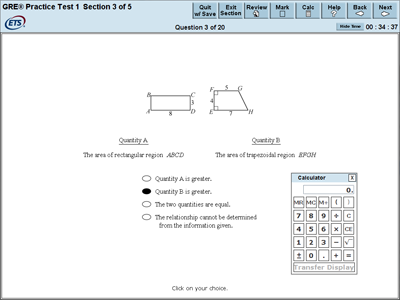 The GRE test is divided into three main sections: Analytical, Verbal and Quantitative. The Analytical Writing section is always presented first. The other two sections are the Verbal and Quantitative sections and they may appear in any order. Here’s important one – there may appear two more sections called Unscored and Research and both are actually unscored meaning they won’t count towards your final score, however in case of Unscored – it can appear in any order after the Analytical Writing section. So, you should treat every portion of the test as if it counts, unless it is indentified as Research. and 1-minute breaks between every other section. Generally plan to set aside at least 4 hours for the test, therefore, have some real test experience before the tests day in order to get used to the pace, pressure and fast switching between subjects. 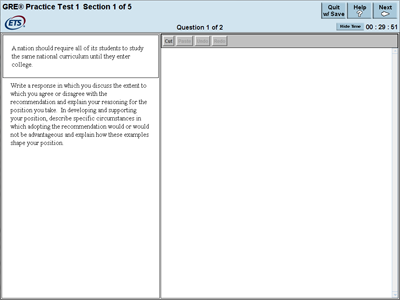 Computer-based GRE test is the most popular version of the test. It is actually section adaptive, meaning that the performance on the first verbal and math sections determines the difficulty of the second sections presented. So don’t screw first sections they will determine whether your score will be in higher or lower range of the 130-170 score scale. The Verbal Reasoning section assess your reading comprehension, critical reasoning and vocabulary usage. So, in plain words, it measures your ability to understand what you read and how you apply your reasoning skills. The Quantitative Reasoning section assess basic high school level mathematical knowledge and reasoning skills, it also includes some real-life scenarios. 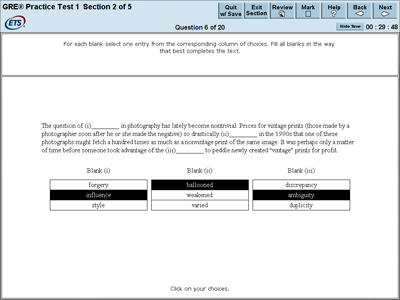 The analytical writing section consists of two different tasks, an “Analyze an Issue” and an “Analyze an Argument” tasks. The essays are written on a computer using a word processing program specifically designed by ETS. The program allows only basic computer functions and does not contain a spell-checker or other advanced features.